Pepper and Salt Skipper is aptly named for its distinctive white on mottled gray ventral hind wing pattern. The greenish-yellow cast of the basal front wing, seen in this dorsal photo, is also a useful field mark. This and the Common Roadside Skipper are our two representatives of the large and widespread Amblyscirtes or Roadside-Skipper genus, and neither is very common here. Pepper-and-Salt is the more habitat-restricted. Although fairly adaptable and widespread, it prefers damp to medium-dry northern woodlands, at medium to high elevations, while the Common Roadside also frequents dry barrens habitats. Pepper and Salt is not a coastal plain species anywhere along the eastern North American coast (Shapiro 1974). It is common in the forests of northern New England, Ontario and Quebec, and through the southeastern states only in the mountains (Opler and Krizek 2004; Cech 2005; Layberry 1998). The central and northeastern Massachusetts uplands and northern Connecticut constitute the eastern edge of its range in southern New England (Map 109 below; and map, O’Donnell, Gall and Wagner 2007). Samuel Scudder at Harvard was the first to describe and name this species, although it was figured but not named by Abbot in Georgia about 1800, in what is probably the very earliest report of this New World skipper. In the tradition of giving Native American names to skippers, Scudder called this one Amblyscirtes samoset in his 1889 work. Samoset was chief of a northern group allied with the Wampanoags. He introduced Chief Massasoit to the Pilgrims and became, like Massasoit, an important Pilgrim ally. A few years earlier, Scudder (1862) had called this skipper both hegon and samoset, thinking that he had two different species (it turned out that hegon was simply the female form). The name ‘hegon’ is probably a contraction of Mohegan; the Mohegans lived in Connecticut and, led by Chief Uncas, supported the English during King Philip’s War (Zirlin 1995). Because Scudder had used the name hegon first, it was given precedence. Scudder's Type Specimen # 8974 in the Harvard MCZ is labeled "Mass." and "colld by FGS." It was collected by F. G. Sanborn in the 1850's or early 1860's, and is the earliest known Massachusetts specimen. Another Scudder Type Specimen, # 8973, is labeled "White Mountains." Thus, White Mountains, New Hampshire, and Massachusetts, as well as Ohio, are the historical "type localities" for this species (Pelham 2008). In the 1880's, Scudder considered Pepper and Salt Skipper to be "nowhere abundant," including in New England. It was most easily found in northern and elevated localities such as Norway, Maine, and the White Mountains, but Scudder also knew of specimens from four surprising low-elevation locations in Massachusetts-- Amherst and Springfield in "the valley" and Belmont and Milford in the east (1889:1590-2). The MCZ has later F. H. Sprague specimens from Wollaston (June 1895) and Malden (June 1896). Through the 1930's this species continued to be “very rare”, according to Farquhar (1934). Farquhar is able to add the locations of Wollaston (F. H. Sprague), and Mt. Holyoke (Forbes), to Scudder's list, but they do not extend the known range much. Nor does a 1940's Wellesley specimen by V. Nabokov in the MCZ. Neither Pepper and Salt Skipper nor Common Roadside Skipper was found on Martha's Vineyard or Nantucket (Jones and Kimball 1943). In the 1960’s and 1970's, Lepidopterists' Society reports and correspondence suggest that Pepper and Salt Skipper may have been increasing in numbers in eastern Massachusetts. In 1965 Charles G. Oliver, reporting for the Acton area, said that both A. samoset and Arctic Skipper were abundant in late May in the dry brushy pine woods in his area. He did not list these as “new occurrences” for this locality, though several other species were so listed. In fact, he had collected one on nearby Mt. Wachusett on June 5, 1957 (specimen at Yale). In 1966 Oliver found one in Wellesley, and William D. Winter collected Pepper and Salt in Dover. In 1973 Winter found two specimens in Canton Fowl Meadow, and one in Dunstable (specimens in the MCZ), while J. S. Ingraham found it in Dedham (specimen at Yale). It was documented for Berkshire County on 2 July 1972, Becket, L. F. Gall (Yale). In 1974 and 1975, Darryl Willis reported the discovery of a colony of A. samoset in Sherborn, in the area today known as the Sherborn power line. The butterflies were present from late May or early June, and specimens were taken on June 21 and 24, 1974 (Lep. Soc. Seas. Sum. and Correspondence, 1959-1981). This Sherborn occurrence and Scudder's 19th century Milford report represent the furthest southeast known locations up to that time, or indeed today. Pepper and Salt Skipper’s known host grasses are several: mainly river oats (Chasmanthium [Uniola] latifolia), indian grass (Sorghastrum nutans), and Kentucky bluegrass (Poa pratensis) (Scott 1986; Opler and Krizek 1984). We do not have any information about what host plant this species actually uses in the wild in Massachusetts. The 1990-95 Connecticut Atlas reared it on Kentucky bluegrass and other Poa spp. in the lab, but the extent of use of those grasses in the wild is not known. Fowl mannagrass (Glyceria striata) is reported for West Virginia (Allen 1997). River oats is not native to or much found in Massachusetts, but indian grass and fowl mannagrass are native and widespread, and Kentury bluegrass, of course, is introduced, widespread, and common (Cullina et al. 2011; Magee and Ahles 1999). The limiting factors for Pepper and Salt in Massachusetts may not be so much the presence or absence of host plants, but rather habitat, elevation, and climate. Pepper and Salt’s preferred habitat is openings in moist, rich deciduous to coniferous forests at moderate elevations. It may be found in woodland glades, edges, roads and trails, and is often near wet meadows or low-lying boggy stream banks (Scudder 1889:1592; Shapiro 1974; Opler and Krizek 1984; Allen 1997; Cech 2005). 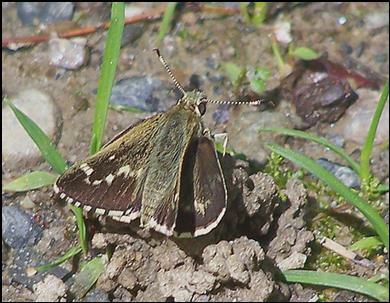 Its forest opening habitat is similar to that of Arctic Skipper. Pepper and Salt is not rare in Massachusetts today, and there has probably been some increase in its numbers since Scudder’s time (Table 2). The 1985-90 Atlas confirmed Pepper and Salt in 42 of 723 blocs, ranking it “Uncommon.” Analysis of MBC field records 2000-2007 also ranks it as Uncommon, albeit on the lower end of the scale, along with Arctic Skipper and Henry’s Elfin. Common Roadside Skipper, on the other hand, ranks as Rare (Table 5). 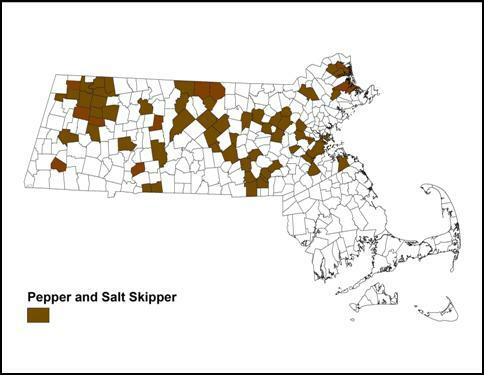 The actual number of Pepper and Salt Skippers seen in Massachusetts each year is quite small: in the years 1992-2009, the total number of individuals reported per year in MBC records was between 9 and 36. Chart 109, MBC annual sightings adjusted by total butterfly trips 1992-2009, shows an undulating pattern, with highs in 1995, 1997 and 2004. The year 1992 should be discounted as less comparable, but even without it, there is a slight drift downward 1993-2009. On the other hand, the unadjusted total of individuals seen increased over these years, perhaps owing to more observer effort put in to find this interesting early spring skipper. And surprisingly, list-length analysis of these same data 1992-2010 found a statistically significant 52.6% increase in detectibility of this skipper (Breed et al. 2012). As suggested in the chart, the average number of Pepper and Salt Skippers per visit to a location decreased 9.9% in 2007, increased 11 % in 2008, and decreased 20% in 2009 in comparison to the average for all preceding years back to 1994 (Nielsen, Season Summary, MB 2008, 2009, 2010). With different measures showing different results, the real trend for Pepper and Salt Skipper in these years is somewhat uncertain. But it did not show such a clear pattern of increase as Dusted Skipper, nor as strong a decrease as Leonard’s Skipper. Pepper and Salt Skipper has been found across most of the state except that it does not usually occur in the southeast, or on Cape Cod or the islands (Map 109). The Atlas distribution was somewhat similar, although the Atlas had one record from North Dartmouth (6/7/1988, M. Mello), and none from the main parts of Essex County, beyond a single report from Lynnfield (5/20/91 S. Goldstein; R. Godefroi also found it in Wilmington 5/20/1991). Many new locales for the species have been found since the Atlas period. Map 109 shows reports from 65 towns 1992-2013. Southeastern Massachusetts: The absence of this species from the southeast of the state, found by the Atlas, is also obvious in BOM-MBC records. There is only one recent record south of Hingham and Canton in the east (Sandwich, Camp Edwards, 5/16/2010, C. Buelow, ph. ; not shown on map). The MAS Atlas had only one southeastern record, from North Dartmouth. Pepper and Salt Skipper has not been reported from Sherborn power line since R. Forster’s report for the Atlas (6/6/1987). Nor does BOM-MBC have any reports from Martha's Vineyard or Nantucket. Mello and Hansen (2004) do not report this skipper for Cape Cod, and the Vineyard checklist does not list it (Pelikan 2002). Central Massachusetts: Here Pepper and Salt ranges further south, to the Connecticut border in Uxbridge to the east (4, West Hill Dam, 6/8/1997, T. and C. Dodd) and East Longmeadow to the west (9, Parker yard, 6/7/2008, K. Parker). The lack of reports from southern Worcester County (e.g. Wales, Monson) is puzzling, but it is well-reported to the north. Berkshire County: The paucity of reports from southern Berkshire County and the southern foothills is also puzzling, but probably simply reflects a lack of visits at the proper flight time. The only two reports are from the towns of Monterey and Washington. Pepper and Salt Skipper does not usually fly at the time of the NABA Counts in July and has never been reported from the Central Berkshire or Southern Berkshire NABA Counts. It has not been reported from either Canoe Meadows or Pleasant Valley wildlife sanctuaries in the central Berkshires. It has been reported a few times on the Northern Berkshire and Central Franklin NABA Counts. Ashburnham Old County Rd., 6 on 5/29/2011, T. Murray (ph. ); Belmont Habitat Sanctuary, 1 on 5/27/2012, M. Rainey http://www.flickr.com/photos/mcrainey/7281249172/ ; Burlington Mary Cummings Park, 3 on 5/20/2010, B. Bowker; Harvard Oxbow NWR, 10 on 5/18/2004 T. Murray; Hubbardston Ware River Watershed, 3 on 6/5/2013, E. Barry and W. Howes; New Ashford/ North Adams Mount Greylock, 31 on 6/5/2013, T Gagnon, S. Moore, R. and S. Cloutier; Monterey, 4 on 6/1/2013, M. Lynch and S. Carroll; Northbridge Larkin Recreation Area, 3 on 5/30/2005 D. Price and W. Miller; Petersham Tom Swamp, 2 on 5/28/2007 E. Nielsen; Royalston, 3 on 6/16/2003 C. Kamp et al. ; Shutesbury Quabbin Gate 12, 9 on 5/19/2012, B. Cassie; Stow Delaney WMA, 4 on 5/17/2012, T. Murray; Westborough Crane Swamp Trail, 4 on 5/21/2010, S. Moore and B. Volkle; Westborough WMA, 5 on 6/13/2008 W. Miller and E. Barry; Windsor Moran WMA, 5 on 5/28/2010, B. Zaremba; Worcester Broad Meadow Brook WS, 7 on 5/21/2001 G. Howe. NOTE TO AMATEUR COLLECTORS: THIS IS AN UNCOMMON SPECIES IN MASSACHUSETTS WHICH MAY BE ADVERSELY AFFECTED BY CLIMATE WARMING. IT SHOULD NOT BE COLLECTED EXCEPT AS PART OF SCIENTIFIC RESEARCH UNDER INSTITUTIONAL AUSPICES WITH NECESSARY PERMITS. MBC 1993-2008 records for Pepper and Salt Skipper show a single flight, stretching from mid- May through mid-July, peaking in last week in May-first two weeks of June (http://www.naba.org/chapters/nabambc/flight-dates-chart.asp). There are two August records from the Atlas years (August 8, 1988, Sheffield, and August 28, 1988, Williamstown, E. Dunbar) which suggest that there might be a partial second brood in the Berkshires. The Connecticut Atlas also had a mid-August record which was interpreted to suggest a partial second brood (O’Donnell, Gall, and Wagner 2007). Shapiro (1974) reported a partial second brood in the Finger Lakes region of New York, and Cech (2005) reports that second broods are found from Virginia south. However, L. Harris (1974) reported only one brood in Georgia, and Allen (1997:241) reported only one in West Virginia, saying that “this skipper is univoltine throughout its range.” It is interesting that the Massachusetts evidence suggesting a second brood occurs at higher-elevation, more northerly locations. Earliest sightings: In 23 years of BOM-MBC records 1991-2013, the five earliest "first sightings" are 5/15/2010 Stow, B. Zaremba (ph. ); 5/15/2004 Harvard Oxbow NWR, T. Murray, 5/16/1993 Worcester Broad Meadow Brook WS, T. Dodd; 5/16/2009 Stow Delaney WMA, T. Murray et al. ; and 5/17/2012 Petersham Quabbin, T. Gagnon. The influence of the particularly warm springs of 2010 and 2012 can be seen here. The Atlas extreme date had been 5/19/1988, Framingham, R. Forster. In 14 of the 23 years of MBC records, the first sightings of Pepper and Salt were in the third week of May (5/15-5/21). In another 7 of the 23 years, the first sightings were in the last week of May (5/22-5/31). In two years, there was no report until June. The third week in May was thus the most frequent first sighting time. These dates are markedly earlier than those quoted a century ago by Scudder for the Boston area. He says that “The single brood of the northern states appears in the imago state early in June and continues through July. About Boston it first appears at the very beginning of June, but at the White Mountains it rarely appears much before the seventh....” (1889: 1591, emphasis added) There would appear to have been some flight time advancement since Scudder's time. Latest sightings: For the same 23 years of BOM-MBC records, the four latest "last sighting" dates are 7/12/1997 Northern Berkshire NABA Count; 7/10/1996 Northern Berkshire NABA Count; 7/9/2006 Mt. Greylock T. Gagnon et al. ; and 7/9/1994 Central Franklin NABA Count. All the other last sightings were in June, but several were also from higher elevations, such as 6/30/2000 Mt. Greylock T. Gagnon, 6/29/2003 Gardner High Ridge WMA M. Lynch and S. Carroll, and 6/17/2013 Berks. Co., T. Gagnon. Given this species’ higher-elevation distribution and habitat, and mostly univoltine brood status, it is probably vulnerable to climate warming trends, and could retreat to higher, cooler elevations if climate warms (Table 6). However, the presence of partial second broods is an adaptive factor. NatureServe (2014) presently ranks Pepper and Salt Skipper as S4 or probably secure in the core states in its range, including Pennsylvania, New York, Vermont, Massachusetts, New Hampshire, Maine, Ontario, and Quebec. Around the edges of this core, especially to the south, it is not so secure. In Connecticut it is S3 or "vulnerable," and in Rhode Island it is S1 or "critically imperiled." In our view, Pepper and Salt Skipper should be a Species of Conservation Concern in Massachusetts. In several states, for example Maryland and Vermont, this species has suffered population declines due to spraying for Gypsy Moths. Aerial spraying of insecticides against mosquitos might have the same effect.